Lamma Island (Chinese: 南丫島), also known as Pok Liu Chau (Chinese: 博寮洲) or simply Pok Liu (Chinese: 博寮), is the third largest island in Hong Kong. Lamma Island has a very different pace of life to nearby Hong Kong island. There are no cars on the island, and all apartments must be built with a maximum 700 square feet per floor. That being said, the weekend attracts many Hong Kong people and each time the ferry docks the town gets very full quickly. Note that although there are hoards of westerners living on the island, it is almost opposite of the sterile culture of Discovery Bay (An expatriate community on Lantau Island). People tend to come and live here for an alternative lifestyle rather than modern living, which makes it great for relaxation. Yung Shue Wan in the north is the main town where most of the island's population lives. It is connected to the central piers. Sok Kwu Wan in the south is basically a street lined with large seafood restaurants. It is connected by ferry to Aberdeen and the Central Piers. Mo Tat Wan is a tiny village to the east with a few houses and a couple of restaurants. The ferry between Aberdeen and Sok Kwu Wan actually stops here, so after eating a large lunch you can stroll over here before catching the ferry back. There is ferry between Aberdeen in the south of Hong Kong island and Sok Kwu Wan. Mondays to Saturdays adult fare HK$12, Sundays and public holidays HK$18. Lamma island is not a place full of tourist attractions, but rather for peace and relaxation. However, there are plenty of restaurants, beaches and hiking trails. Walk between the main towns. The walk between Yung Shue Wan and Sok Kwu Wan is pleasant and not too challenging. Maybe plan 60 to 90 minutes to get across. Mo Tat Wan is another 30 minutes walk. Note in summer you should wear a hat for shade and carry plenty of water. This walk takes about an hour and is well sign posted. It passes a beach which offers swimming facilities within a shark free net and great views of the power station. The walk also provides great views of the island. After the walk, you can dine at the seafood restaurants adjacent to the ferry terminal. Although the walk is not difficult, it has a few steep sections and in summer with high temperature and humidity it can feel strenuous. 22.2189114.1191 Hung Shing Ye Beach (15 minutes from Yung Shue Wan). This is a nice beach close to Yung Shue Wan. It is somewhat overshadowed by having a coal fired Power Plant in the background. 22.201573114.1297753 Kamikaze Caves, Sok Kwu Wan (You will encounter these on the path from Yung Shue Wan). These caves near Sok Kwu Wan were apparently built by the Japanese army to hide speedboats that could attack allied ships by surprise. Sea Kayak Tours. Sea Kayak Hong Kong offers sea kayak tours around the coast of Lamma Island. There are 2 distinct tours around Lamma Island, both originating from Sok Kwu Wan in the centre of Lamma Island. Tour 1 - the southern Lamma Island tour which comprises paddling past stark granite hills dropping into the South China Sea with remote, unvisited beaches and Sham Wan (Turtle Beach). 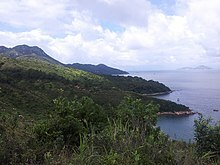 In contrast, the northern tour of the island tour takes you up the East Lamma Channel facing Hong Kong harbour. The contrasts between the two coasts are startling, almost surreal with Lamma being uninhabited (small local villages) while just across the channel is south Hong Kong Island with skyrise apartments towering over well-developed beaches. The trip finishes in Yung Shue Wan so kayakers can catch a ferry back to Hong Kong. More details can be found on the Sea Kayak Hong Kong website. Generally speaking, there isn't a lot to buy on Lamma Island. Yung Shue Wan has a variety of small shops with some art & craft. You can also buy beach supplies here, and there is even a HSBC bank branch. Sok Kwu Wan has stores that sell dried fish. Peanut Candy is available in So Kwu Wan, Lamma Island. Yung Shue Wan has many seafood restaurants as well as western style cafes and bars. There is a strip of seafood restaurants in Sok Kwu Wan. Expect to pay around $100 - 150 per head for the set meals, which will include fried clams, lobster, crab, prawns as well as fried vegetables, rice and drinks. A steamed fish will cost around $100 depending on the weight. There are numerous general stores on the island selling drinks, snacks, prepackaged food, everyday supplies and toys. There are several such stores in yung shue wan, a few in sok kwu wan, one in mo tat wan and at least one in pak kok. 22.204725114.1311423 Rainbow Restaurant. The first, last and one in between are Rainbow restaurants with great food. A small lobster cost $140 and a small Salt and Pepper Squid cost $80. They also offer a free ferry service for customers which is a great way to see the harbour. 22.225782114.1115844 The Bookworm Cafe, Yung Shue Wan. Great ambiance and tasty vegetarian food, it also provides free internet access. 22.225176114.1115415 Pizza Milano, Yung Shue Wan. Munch on a slice at this Italian eatery. There are some bars in Yung Shue Wan. The best location for accommodation is Yung Shue Wan. Internet is available on the island, although speeds are low. 3G mobile phone access is available throughout the island. This city travel guide to Lamma is a usable article. It has information on how to get there and on restaurants and hotels. An adventurous person could use this article, but please feel free to improve it by editing the page. This travel guide page was last edited at 16:31, on 7 April 2019 by Wikivoyage user OhanaUnited. Based on work by Wikivoyage users ARR8, Traveler100bot, Lazjak, DaveWilson57, Wrh2, YiFeiBot, Matroc, Torty3 and Andrewssi2 and others.